As always, gorgeous work! Sylvia is lucky to have a mom like you. Love the color choices for both (including the buttons!). Two sweaters is a great feat: well done! Especially side by side, these are great examples of how a vibrant yarn adds pizzazz to a simple stitch pattern, while a solid color makes a lace pattern pop. 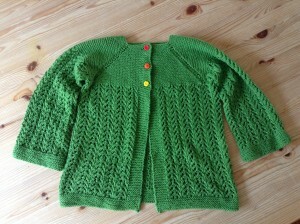 I like the idea of knitting for a child: items (hopefully) get more wear than infant-sized garments typically do, and the knitting is less of a commitment than for adult-sized pieces. Too bad I don’t have any youngsters in my life quite yet! @Jean: Thanks! And I totally agree about knitting for little ones. I’m finding that as Sylvia ages, knitting for her definitely takes longer and longer! First, I am so excited to see you blogging again! I have missed reading it dearly. Second, those are some wonderful looking sweaters! Look how far you have come with your knitting. I love love love the buttons Sylvia chose for the February Lady sweater. 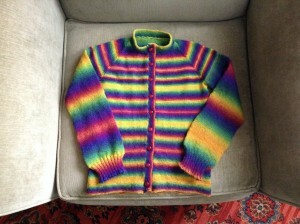 I have been picking up and putting down knitting so much during the last year. I actually spent time with a project this past weekend that I am determined to finish. @Deborah: Thanks! I’m glad to see you blogging again, too! 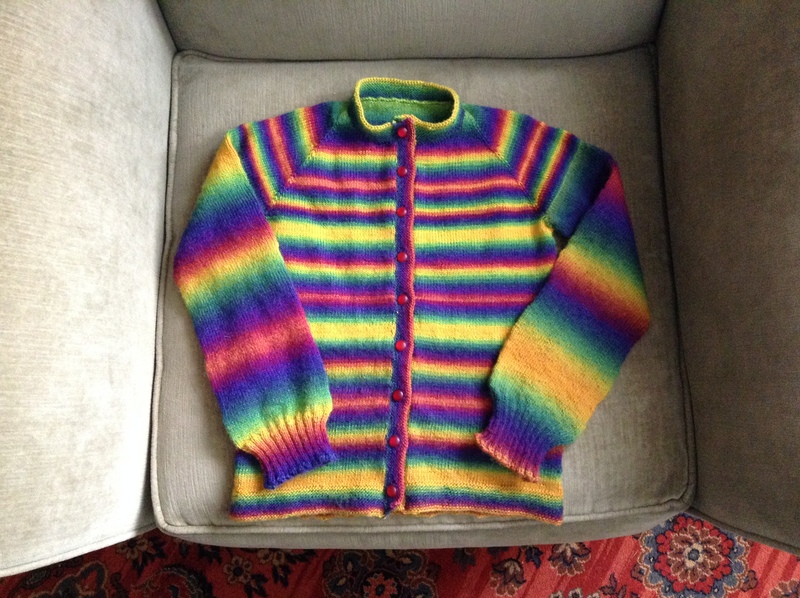 And I hope to see some of your knitting and sewing projects, too. That black-and-white bag you made for me is still my sock project bag that goes with me pretty much everywhere!